Marines of the 2nd Battalion under Major John W. Antonelli, 27th Regiment, 5th Marine Division inch their way up Red Beach One at 0904 Hours. 27th Marines was commanded by Colonel Thomas A. Wornham. 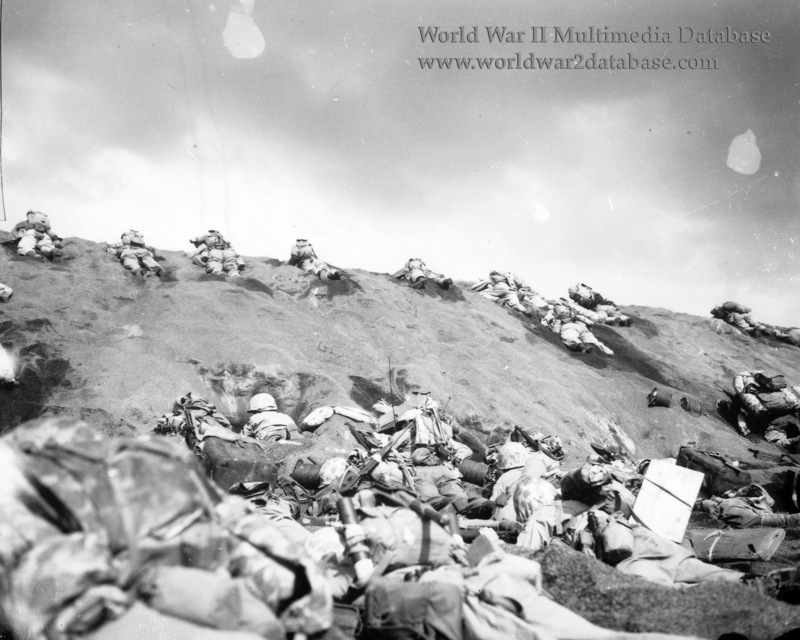 Initially facing light opposition, the 27th Marines cut the island in two, isolating Mount Suribachi from the Japanese in the North. Both battalions of the 27th advanced rapidly despite mounting casualties, bypassing many positions along the way. By 1130 Company A was infiltrating across the southern end of the airfield and building up along the western edge. Company C, on the left, had passed the field and held a line that extended about 250 yards in a northwesterly direction from the southwest end of the field. The 2d Battalion was generally abreast, with Company F maintaining contact with 1/27 on the right. Among the casualties at this time was the regimental executive officer, Colonel Louis C. Plain. While in the front lines he was hit in the arm, but continued his inspection and made his report before being evacuated. The 1st Battalion, supported by M4 Sherman tanks from the 3d Platoon, Company A, turned north against determined enemy opposition, while the 2d Battalion, with the 1st and 2d Platoons of tanks, drove to the west. Aided by this armor, the Marines were able to reduce positions that had been stubbornly resisting, but the presence of the Shermans in the front lines attracted heavy Japanese antitank fire, which plagued the infantry. The 1st Battalion made little progress to the north, but the 2d pushed on and reached the cliffs overlooking the west coast at about 1500. The 3d Battalion, commanded by Lieutenant Colonel Donn J. Robertson, landed in RCT reserve at 1130 and followed 2/27 at 200 yards, mopping up bypassed positions.